Where’d that Workflow Farm go? Hopefully, you documented the names of your servers, their resources, the network they reside in, and to which SharePoint Site collection they’re hooked into, when you rolled out that Workflow Management Farm and it’s clients for your SharePoint 2013 farm. On the off chance that you just ran up that farm, and didn’t document anything, here is a way to determine where it is linked and the name of the server running the management agent. 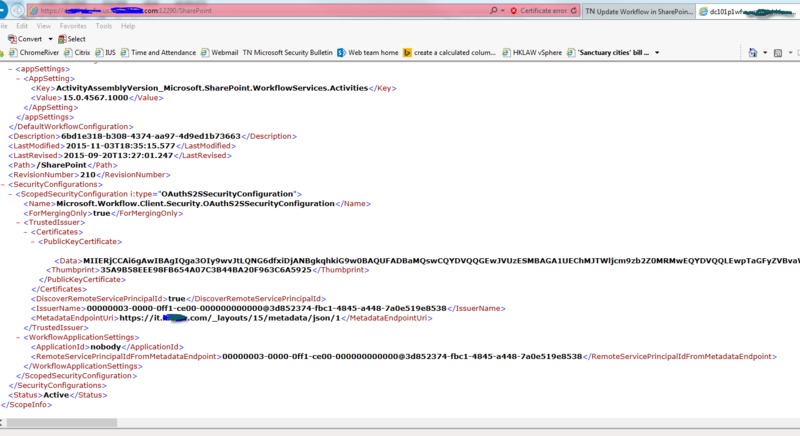 The powershell kicks back the name of the server hosting the management agent, e.g. Towards the bottom of this page, you can see the site that the workflow service is hooked into, in this case, it is hooked into the IT host named site collection.